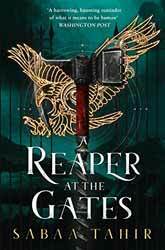 A Reaper at the Gates (2018. 463 pages) is the third book in the Ember Quartet, written by Sabaa Tahir. The book tells its story from a few perspectives. Each of the chapters takes the point of view of a single character, including The Nightbringer, Elais, Laia and The Blood Shrike. One, among many, of the good points of the book is that Tahir has created complex characters with difficult motivations. Many of the characters are torn between love and duty and this is a theme which runs through the whole novel. There are no pantomime bad guys, although the Commandant comes close and is probably the least well-rounded character. Elais is the most conflicted character. Having relinquished his humanity to become immortal, his love for Laia, binds him to this world, as she binds his heart. While he cannot let go of his love, he is unable to fully utilise the power of the Soul Catcher. Consequentially, souls are not passing through as they should and are building a pressure in the grove, a pressure which threatens to burst, releasing the dead back into the world. The Blood Shrike is also torn. Although she loves the Empire, she despises the Emperor, wishing only for his death, but as his second she has a duty to protect both him and the Empire. His hold over her is further enhanced as the empress is the Blood Shrikes sister and Marcus thinks nothing of threatening her to keep the Shrike in line. The Nightbringer is the most enigmatic character in the book. Once a powerful fey, whose people were murdered and imprisoned by the Scholars, who are now second-class citizens, having been conquered, in turn, by the Empire. He searches for the parts of the magic star to free his people. The Commandant helps him for the power that he can offer in her conquest of the Empire and Laia works to keep him away from the pieces knowing that possession by the Nightbringer will be the end of humans. The narrative is built up from the weaving together of the individual stories. This allows Tahir to spread the narrative out, giving it greater depth and breadth. That said, characters need to be explored more and I’m afraid the book does not work well as a standalone. It does have a map which will orientate you to this Romanesque world, but the relationships between some of the characters were more obscure than they needed to be, a problem which could so effortlessly have been rectified with a list of dramatis personæ. I enjoyed the book as much as the first two, a good story for readers who like a lot of action and growingly complex reasons for character actions.